This elegant new luggage line by Rimowa is the result of the consistent further development of the successful Salsa series, and only for this reason, it embodies toughness in itself. Each case is nearly indestructible and fully featured. This clever, stylish business case can accommodate clothing and laptop. It can be slid down any wheeled luggage piece with it's stretchy outside strap. We stock most of the Salsa Deluxe collection in four fashionable colors: Black, Brown, Oriental Red and Yachting Blue. On the Outside, this collection is made with 100% polycarbonate. Rimowa's polycarbonate luggage is feather light, extremely durable, almost completely shatter-proof and able to withstand tremendous pressure. Resistant to UV, hot and extreme cold weather. Some additional features include easy to 4 manuever spinner wheels, a TSA approved luggage key and lock system, side and bottom bumpers, and a quality telescopic handle. The new and fully removable divider system in the interior ensures that even delicate clothes are transported safely and remain crease-resistant. The case contents are simply fixed by straps and fasteners in order to prevent any sliding, even if the case is only half full. We currently stock this case in three fashionable colors: Black, Brown and Oriental Red. In the Inside, there's a large filling area that unsnaps to reveal a place to pack clothing and a 15.5 computer padding that has a handle for easy carrying outside of the case. 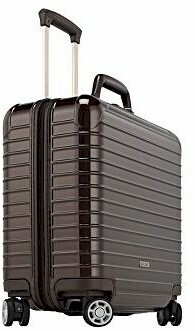 All Rimowa Luggage pricing includes Free domestic shipping and more. Also, no sales tax if shipped to anywhere outside the state of Michigan. On line ordering is of the highest level secure format. We have been in business for over 50 years and offer 30 day Money Back Guarantee. All Rimowa pieces are backed by Manufacturer's Warranty. We also can gold hot stamp your initials at no extra charge, just specify desired initials under "Special Instructions" when placing order.